Snippets of Jack: "This I cannot wait to see." "This I cannot wait to see." It is my greatest pleasure to announce to you that on January 14, 2013 A.D., Disney announced that they will be bringing Johnny Deppback for a fifth Pirates of the Caribbean movie, aimied to be repleased on July 10, 2015! Up untl this point Disney admitted they were working on a plot but there was no official announcement, but now we can mark it on our calendars! Only 903 more days! Jerry Bruckheimer will once again produce and the screen play will be written by Jeff Nathanson. Who's excited? I AM! I know you're probably thinking, "That's over two years away." But at least there is hope. So in honor of this most spectacular news, I feel like we should do a quick recap of ALL the past movies. In The Pirates of the Caribbean: Curse of the Black Pearl, Captain Jack Sparrow is off to recapture the Black Pearl from his mutinous first mate, Hector Barbossa. Barbossa is after an unknown heir of William Turner and his last peice of cursed Aztec gold. 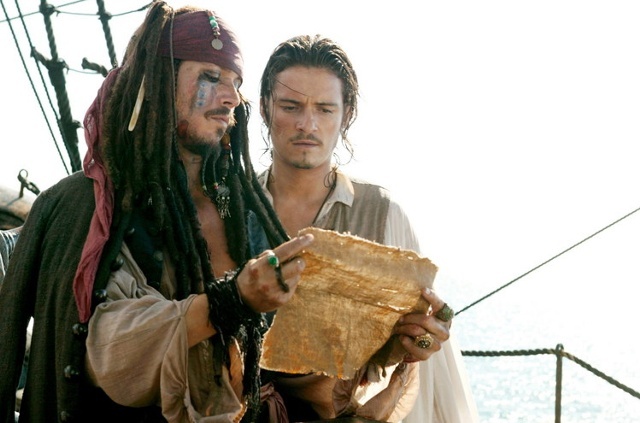 In the meantime, Will Turner and James Norringtion are after the hand of Elizabeth Swann. Barbossa finds Elizabeth, so Will finds Jack, who finds Barbossa, who leaves Elizabeth and Jack on an island, who are then found by Norritngton, who then finds Barbossa and Will, who then lifts the curse on Barbossa, who is then dead. With Barbossa dead, Jack gets back his ship and Will pushes Norrington out of the way and wins Elizabeth. Obviously there's more the brilliant story than just that, but that's the overview. Moving on to The Pirates of the Caribbean: Dead Man's Chest: Jack Sparrow has the Black Pearl for a bery short amount of time before some bad news arrives: Jack owes his soul to Davy Jones. Bad news also hits Will and Elizabeth when they are arrested by Lord Cutler Beckett. Similiar to the first movie, both of their problems connect when Will goes running to Jack for help. Once again, Jack uses Will's desperation for his advantage: he gets Will to find him the key to the chest. Elizabeth (and later Norrington) help Jack find the chest. To revenge the fact that Will got Elizabeth and the glory at the end of the last movie, Norringtion uses the contents in the chest to redeem himself. Jack gets the short end of the stick when Elizabeth feeds him to Davy Jones' pet, the kraken. 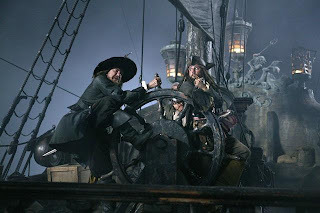 Just when all hope seems to be lost, Hector Barbossa is back, but this time he intends to help Jack by getting him out of Davy Jones locker, which brings us on to the next movie. In The Pirates of the Caribbean: At World's End, the gang sails to the world's end (shocker), to rescue Jack and the Pearl. Together, they all set sail to Shipwreck Cove for the meeting of the Brethren Court. 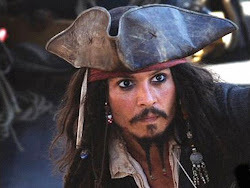 Of couse, they run into Beckett on the way there, who is threatening to kill all pirates in the Caribbean. After a set of complex negotiations, they finally arrive at Shipwreck Cove, with three of the nine pirate lords: Jack, Barbossa, and Elizabeth. A LOT of bickering goes by and they finally agree to fight Beckett's armada and the Flying Dutchman, which they are actually sucessful in doing, minus a few casualties including Will Turner. Will and Elizabeth have a brief wedding but Will has to become the cpatain of the Dutchman as the only way to live. So alas, Will gets a ship and a wife but Jack doesn't even keep the Pearl because stupid Barbossa stole it from him, again. Jack gets back the Pearl in The Pirates of the Caribbean: On Stranger Tides after Barbossa looses it to the infamous pirate, Blackbeard. Jack also gets a rather complicated love story when he is reunited with Angelica, his past love and daughter of Blackbeard. He sails with Angelica and Blackbeard on the Queen Anne's Revenge to the Fountain of Youth. Along the way, we see yet another love story brewing between Syrena the mermaid and Philip Swift, the missionairy. 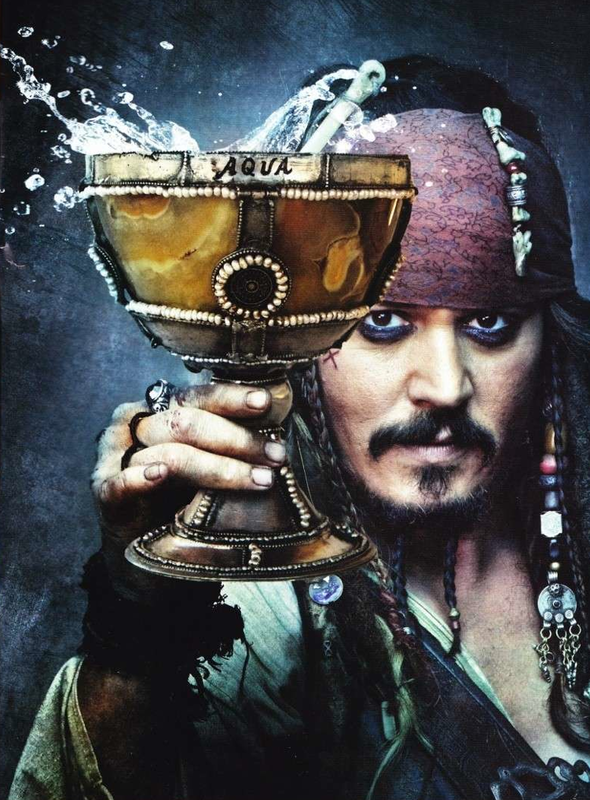 Once they've reached the fountain with Syrena's much coveted tear and Ponce de Leon's chalices, they clash with the British Royal Navy lead by Hector Barbossa and the Spanish, lead by the Spaniard :P. After some intense battles, Blackbeard dies so Barbossa takes his ship. Gibbs manages to get the bottled Black Pearl and Angelica gets landed alone on an island. Jack finally has the Pearl back but how will he get it back to its normal size??? I guess we'll see in 2015! Small correction: Jerry Bruckheimer is producing, not directing. Being a producer and a director are 2 different things...well, save for cases like Chris Nolan on The Dark Knight trilogy. Oh yes! You are totally right. We'll get on that right away! Thanks for reading and pointing this out. -Do something Jack would do today!